What Is DA Form 7415? DA Form 7415, Exceptional Family Member Program (EFMP) Query Sheet is a form used to identify Soldiers with family members that may have special needs. This form is a part of a set of forms required for enrolling in the Exceptional Family Member Program (EFMP). The latest version of the form - often incorrectly referred to as the DD Form 7415 - was released by the Department of the Army (DA) in June 2009. An up-to-date DA Form 7415 fillable version is available for digital filing and download below or can be found through the Army Publishing Directorate website. The EFMP is designed to assist Active Duty Soldiers who have special-needs family members. The program is aimed to provide the medical, educational, housing and personnel services as well as community support to dependents with any condition that requires therapy. How To Fill Out Da Form 7415? For use of this form, see AR 608-75; the proponent agency is ACSIM. Army; and Army Regulation 608-75, EFMP. To identify soldiers that have family members for enrollment in the EFMP. treatment when the Department of the Army does not have a suitable treatment facility. level of a general practitioner? 7. If the answer to the above question is yes, is the family member enrolled in EFMP? community support, educational, housing, personnel, and medical services to families with special needs. assignment process whereas special education needs are only considered in overseas assignments. 9. The above information is true and correct to the best of my knowledge. The Soldier has to fill their name, rank and their unit in the first three Boxes. Boxes 4a and 4b require the service member's home address and home phone number. Boxes 5a through 5d are for the location of duty: the address, phone, and fax numbers, as well as an email. 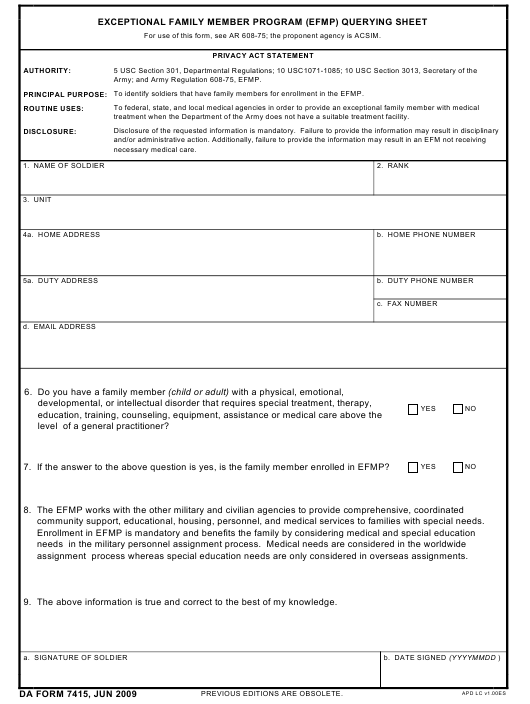 The next section of the form contains two questions: if the Soldier has a family member with special needs and if this person is already enrolled in the EMFP. The Soldier has to sign and date the form before submitting it further through the chain of command. DA Form 7426, EFM Screening Questionnaire is a form used for gathering and recording information about the condition of the family member with special needs. DA Form 5888, Family Member Deployment Screening Sheet is used to validate family member deployment screenings and to assist the gaining command in making decisions about the Soldier's assignment. DA Form 5888-1, Screening of Family Member in Remote OCONUS Areas is used only if the family member is making a move to overseas areas outside of the U.S. and is a summary of their medical and educational condition. DD Form 2792, Family Member Medical Summary is filled by the medical facility personnel and contains the summary of health-related information about the family member with special needs. DD Form 2792-1, Special Education/Early Intervention Summary is used to collect information on the educational or early-intervention needs of a Soldier's dependent family member.